Bikeradar.com, a UK-based website, put the 2012 Anthem X 29er to the test, posting a glowing review recently on its website. Editors of the review, which also appeared in What Mountain Bike magazine, praised the Anthem X 29er 1 test bike for its low weight, great handling, and proven Maestro Suspension. “There’s one thing that immediately makes the Anthem X 29er stand out next to its immediate competition, and that’s weight, or rather, lack of it,” they wrote. “At a hair over 12kg and under the magic 27lb barrier, the Giant certainly isn’t carrying any excess baggage. Compared with lardier rivals, it positively bounds up the hills.” To read the full review, go to bikeradar.com. 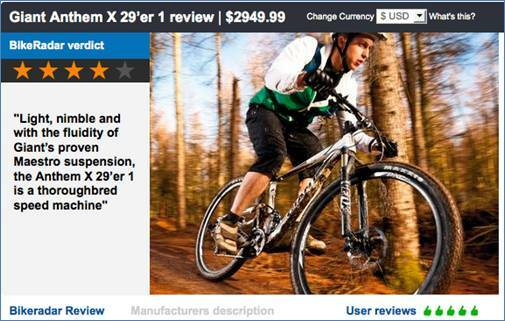 As of today, Century Cycles has one Giant Anthem X 29er 1 in stock (size medium in Medina). 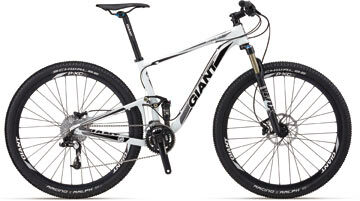 We also have the Giant Anthem X 29er 2 in stock (size small in Rocky River; sizes medium and large in Medina). Any of them can be transferred to Peninsula or the store closest to you for test-riding!